I’ve had the First World War on my mind since before the 100th anniversary of its start, almost two years ago. Quite a bit was done and written in the months just before August 2014, and there have been trickles since. This week, I’ve become enamored of a delightful pair of books that look at the Great War through a literary lens. 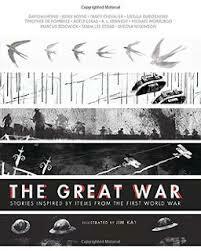 The Great War: Stories Inspired by Items from the First World War is a collection of modern stories, written by an amazing array of contemporary YA authors (David Almond, Michael Morpurgo, John Boyne, AL Kennedy, Marcus Sedgewick, Adele Geras,Tracy Chevalier, Frank Cottrell Boyce, Sheena Wilkinson, Ursula Dubrovsky, Timothee de Fombelle) and illustrated by Jim Kay. Publisher’s Summary:A toy soldier. A butter dish. A compass. Mundane objects, perhaps, but to the remarkable authors in this collection, artifacts such as these have inspired stories that go to the heart of the human experience of World War I. Each author was invited to choose an object that had a connection to the war—a writing kit for David Almond, a helmet for Michael Morpurgo—and use it as the inspiration for an original short story. What results is an extraordinary collection, illustrated throughout by award-winning Jim Kay and featuring photographs of the objects with accounts of their history and the authors’ reasons for selecting them. This unique anthology provides young readers with a personal window into the Great War and the people affected by it, and serves as an invaluable resource for families and teachers alike. That collection of short stories would pair nicely with this collection of biographies of 12 men and three women, who participated in the First World War, and who later gained fame in other ways. In the Fields and Trenches:The Famous and the Forgotten on the Battlefields of World War I is written by Kerrie Logan Hollihan and published by the Chicago Review Press. 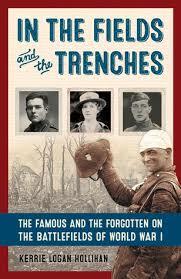 Publisher’s Summary: When it started, many thought the Great War would be a great adventure. Yet, as those who saw it up close learned, it was anything but. In the Fields and the Trenches traces the stories of eighteen young idealists swept into the brutal conflict, many of whom would go on to become well-known 20th-century figures in film, science, politics, literature, and business. Writer J. R. R. Tolkien was a signals officer with the British Expeditionary Force and fought at the Battle of the Somme. Scientist Irène Curie helped her mother, Marie, run twenty X-ray units for French field hospitals. Actor Buster Keaton left Hollywood after being drafted into the army’s 40th Infantry Division. And all four of Theodore Roosevelt’s sons—Kermit, Archibald, Quentin, and Theodore III—and his daughter Ethel served in Europe, though one did not return.In the Fields and the Trenches chronicles the lives of heroes, cowards, comics, and villains—some famous, some not—who participated in this life-changing event. Extensive original material, from letters sent from the front to personal journals, brings these men and women back to life. And though their stories are a century old, they convey modern, universal themes of love, death, power, greed, courage, hate, fear, family, friendship, and sacrifice. Together, these two books give readers a glimpse into the impact of The Great war on ordinary lives.